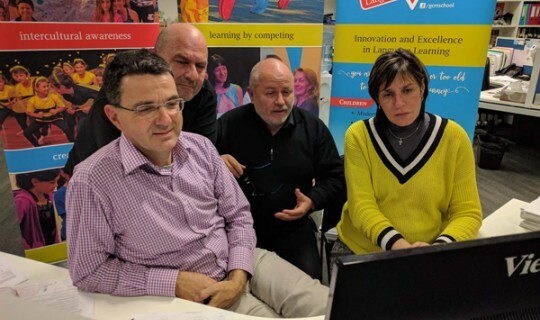 A teleconference with the Greek Deputy Minister of Education Mr. Kostas Zouraris was recently organised by the education officer of the Greek Community of Melbourne (GCM) and the Education Consul of Greece in Melbourne. On behalf of the Ministry for Education the Deputy Minister Mr. Kostas Zouraris and the Director of his Office Ms. Alkistis were the main participants, and from Melbourne the participants were: the GCM Vice President and Education Convenor Mr. Theo Markos, the Principal of the Language and Culture School, Mr. Manos Tzimpragos, and the coordinator of the Ancient Greek and Modern Greek Teaching Program for Adults, Mr. Alexandros Giannadakis, as well as the Education Consul of Greece in Melbourne, Ms Georgia Nikolaidou. During the teleconference, several issues related to GCM’s proposals for the improvement of Greek language programs in Melbourne were discussed. GCM’s main priority is to re-activate the programs of hosting students at holiday camps in Greece, combined with the organising educational tours and activities, Greek language courses, cultural events and visits to archaeological sites. Also, the student exchange programs between Greece and Australia were discussed and the Ministry for Education was asked to assist in resolving the technical or legal difficulties such programs may entail. In addition, the GCM stressed to Mr Zouraris the need to further create training and professional development programs for teachers in association with Greek educational institutions. On behalf of the GCM, Theo Markos noted that "The GCM is investing an enormous amount of resources in preserving and promoting our language and culture in Australia”, he further noted that “with the close cooperation of the relevant Greek diplomatic and educational authorities, the success of this common goal is guaranteed. The positive response from both the Ministry for Education and the Education Office of the Consulate General of Greece in Melbourne are very important, as these communications provide the starting point for future constructive cooperation for the successful realisation of our goals."